ii) Optimal utilization of funds and human resources. iv) Identify for all modes, a phased program of appropriate and affordable investments and policy proposals; and also integration of various modes of mass transits. 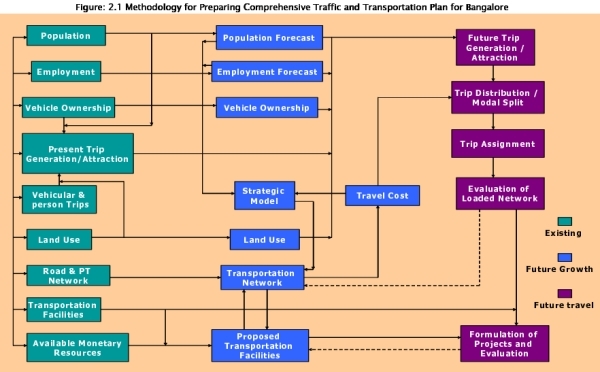 v) Help strengthen transport planning skills, and transfer all data, planning model/tools and knowledge obtained through the study to KUIDFC and other agencies such as BDA, BMTC, KSRTC, South Western Railway, BMRTL, Traffic Police, etc. viii) Assess existing infrastructure and forecast requirement - short term and long term. In line with the specific objectives of the study described above, the scope of work is divided roughly into the following areas of activities as follows. The adopted study methodology to achieve the set objectives and scope is given in Figure 2.1. The study methodology adopted can be broadly divided in to five stages. -- Secondary data collection and analysis. -- Detailed sampling basis and questionnaires for Household interviews, Business interviews and Roadside interviews. -- Base road and public transport network survey. -- Draw up Proposal for traffic surveys like speed- flow, parking, traffic counts, network inventory, and their analysis. -- Required computer program suites etc. The second stage was the collection of information, and review of existing transport scenario. In order to collect various travel information following surveys were conducted. The data so collected was analyzed and validated to the existing traffic scenario which forms an input to the transport models. -- Analyzing the traffic situation in terms of present situation and constraints and future growth. -- Proposed land use based on the newly prepared Master Plan. -- Analyzing the transportation demand vis-à-vis the supply and the constraints. -- Analyzing the present institutional arrangement and future requirement. -- Recommending Organizational set up and institutional arrangement for implementation of plan.